The Weather Guy: Bye-Bye Summertime! It is the last day of summer today (Sunday, September 21st). Fall equinox arriving tomorrow! In not too many days, we'll see the leaves change and fall from the trees here in Middle Tennessee. 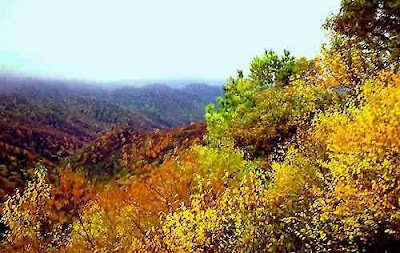 Typically, we can count on the last three weeks of October for peak fall colors over in the Smoky Mountains...here in Middle Tennessee, it is 10 days to 2 weeks afterwards. Looking back at summer, here is how our high temperatures stacked up versus the normal high. On this date way back in 1956, the temperature fell to 33 degrees in Crossville. Crossville is about 35 miles to our east. Thanks to the NWS-Nashville for that piece of information! Nice fall photos! Some of my other fellow WeatherBug Reporters have posted some at the WeatherBug Blog as well. When I go on my Georgia trip in a couple of weeks I hope I'll have some to post as well. HELLO ! MR. MIKE ! COOKEVILLE`S WEATHER GUY ! I`M WILLIAM E. BRANTLEY ! FROM BEMIS - JACKSON, TN. I ALSO HAVE A WEATHER WEB SITE : www.williamebrantley.wordpress.com THERE YOU CAN CLICK ON MY SEASONAL SUMMARY AND SEE THE TEMP`S & RAINFALL FACT`S FROM BEMIS, TN. EDDIE HOLMES IS A GOOD FRIEND OF MINE HERE ! I HOPE YOU GET A CHANCE TO CKECK OUT MY SITE AS WELL . THANK`S FROM BEMIS, TN . SUMMER 2008`s AVERAGE TEMP WAS 79.2* / 0.8* ABOVE NORMAL ! THE HOTTEST HI WAS 99* ON JULY 21 st , AUG . 2 nd & 5 th ! THE LOWEST HI WAS 80* ON AUG . 12 th ! THE WARMEST LO WAS 77** ON AUG . 2nd ! THE COLDEST LO WAS 57* ON JUNE 18 th , 19 th & JULY 1 st ! RAINFALL TOTAL WAS 10.90 “ / 0.75 “ BELOW NORMAL ! SUMMER`S WETTEST DAY WAS 2.42 “ ** ON JUNE 13 th ! BEMIS HAD 68 DRY ( 0.00 “ ) DAY`S ! this is from my web site : www.williamebrantley.wordpress.com - i hope it is handy information for your site . thanks from bemis , tn.